Haveri is a city in Karnataka. The name Haveri is derived from the Kannada words "havu" and "keri", which means "place of snakes." Haveri is famous for its cardamom garlands. It is said that Haveri had around 1000 maths (sacred religious places) in ancient days. One of the famous maths is Hukkeri Math. Haveri is also famous for marketing Byadagi red chillies, which are well known all over India. Around 15 kilometers away, there is a place called Kaginele which is the birthplace of the poet Kanakadasa. Haveri is 7 hours away from Bangalore by train. It is the stop 72 km before Hubli and 72 km after Davanagere. By road, it is about 340 km from Bangalore on NH-4 towards Mumbai. Distance from Haveri to Raichur, Karnataka is 3.3 km and takes around 6 h 14 min via Raichur - Koppal Road. Distance from Haveri to Kumta, Karnataka is 135.1 km and travelling takes around 2 h 45 min via SH 2 and Sirsi - Kumta Road. Haveri district is proud to be the birth place of Santa Shishunala Sharif, the great saint Kanakadasaru, Sarvagnya, Hanagal Kumara Shivayogigalu, Wagish Panditaru, Writer Galaganatharu, Ganayogi Panchakshari Gavayigalu, Gnyana Peetha Awardee Dr.V.K.Gokak and many more. The freedom fighters Mailara Mahadevappa and Gudleppa Hallikere. History of Haveri district dates to pre-historic period. About 1300 stone writings of different rulers like Chalukyas, Rastrakutas are found in the district. Bankapura Challaketaru, Guttavula Guttaru, Kadambas of Hanagal and Nurumbad are some of the well known Samanta Rulers. Devendramunigalu the teacher of Kannada Adikavi Pampa and Ajitasenacharya the teacher of Ranna Chavundaray lived in Bankapura. This was also the second capital of Hoysala Vishnuvardhana. Guttaru ruled during latter part of 12th century and up to end of 13th century from Guttavol (Guttal) village as Mandaliks of Chalukya, independently for some time and as Mandaliks of Sevuns of Devagiri. Shasanas found in Choudapur, a village near Guttal, reveal that Mallideva was Mandalika of 6th Vikramaditya of Chalukyas. Jatacholina, under the leadership of Mallideva built the Mukteshwar temple at Choudapur. Kadambas of Nurumbad during the period of Kalyani Chalukyas ruled about 100 villages with Rattihalli as their capital. Siddhesvara Temple at Haveri a staggered square plan with dravida articulation and superstructure, 11th century CE. Rock Garden is conceived and designed by internationally renowned artist Prof. T.B. Solabakkanavar. Rock Garden over 2000 international quality Sculptures depicting Rural Life and cultural Heritage of Karnataka. Main attractions are Dr. Rajkumar Circle, Artistic Banyan Tree, Sculptural fountain, Marriage Museum, Modern Art Gallery, Traditional Doors, Typical Village of forgotten rural empire, Traditional Agricultural Systems, Model Dairy, Animal World and Folk Market. Breakfast, Lunch, Beverages, Ice Creams and Evening Snacks are available at Hotel inside. Kanakadaasa Fort at Baada (11 KM), Nagareshwar Temple at Bankapur (8 KM), Gayatri Tapovan at Tadas (25 KM), Tibetian Camp at Mundagod (42 KM) and Navagraha Tirtha at Varur (25 KM) are the main tourist attractions near Utsav Rock Garden. 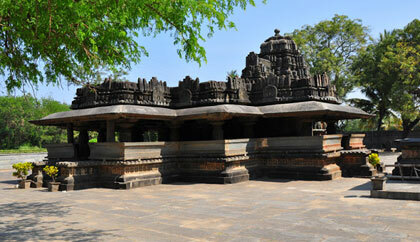 Galageshwara Temple in the Haveri district of Karnataka is one of the most beautiful Shiva temples in the region. Madhukeshwara Temple is located in Banavasi town in Uttara Kannada district. Mukteshwara Temple - The district of Haveri in Karnataka is dotted with hundreds of temples dedicated to different Gods and Goddesses and built by various dynasties in their own styles like the Dravidian, Hoysala, Chalukyas and Vijayanagara. 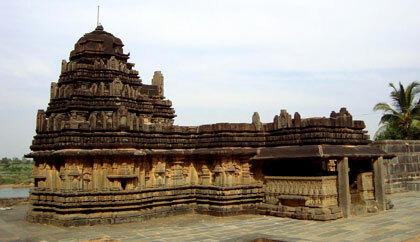 Siddhesvara Temple is situated in the district of Haveri in the Karnataka. Kaginele also known as "Kaginelli" is a village in the Byadagi taluk of Haveri district in the Indian state of Karnataka. It is famous as the birthplace of Kanaka Dasa a great saint from Kuruba Gowda (Halumatha) community. He lived and wrote most of his works in Kaginele. The "Keshava"(Krishna) temple is situated in Kaginele. Keshava was the family deity of shri Kanaka Dasa. All of Kanaka Dasas poems end with the "Ankitha Naama" Kaginele aadi Keshava. In August 2004, the Karnataka State Government decided to form Kaginele Development Authority (KDA) to protect all the monuments and the documents related to Kanaka Dasa. Shri. Kanakadas Kaginele guru aadikeshava gurupeetha was established as a spiritual and cultural centre of halumatha community in the state of Karnataka. The Mahasamsthana is started by Shri Beerendra Keshava Tarakananda Puri Swamiji who had work very hard to develop this Shri. Kanakadas Kaginele contiously for thirteen years. This Kaginele Shri. Kanakadas guru peetha is very famous in INDIA as many this community people living in many other states in country. This guru peeta also famous in in other countries as well like USA, UK, Europe and Australia it is famous for spiritual and devotion. Distance from Haveri to Bankapur, Karnataka is 21.0 km and takes around 25 min via NH48. Distance from Haveri to Raichur is 3.3 km and takes around 6 h 14 min via Raichur - Koppal Road.